Most poker players would consider finishing 11th in the World Series of Poker Main Event to be an amazing accomplishment. Maybe not in the moments following their elimination, but eventually they’d accept what they did as something special. For the last two years, John Cynn has allowed his 2016 11th place finish to be his career-best score. 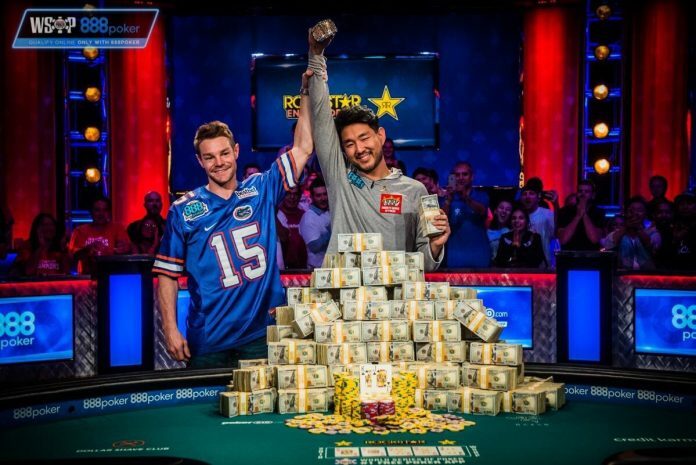 Sunday morning, however, following an epic heads-up battle with Tony Miles, Cynn changed all of that by winning the 2018 WSOP Main Event and walking away with $8.8 million. Winning the fifth largest Main Event prize in the 49-year history of the WSOP, Cynn is well aware of how that money is going to change his life. He did have some more immediate plans for spending some of his winnings though. “I might use some of it to party with my friends, but other than that I think I’m going to let my emotions die down before I decide to do anything crazy, probably just get away, disappear somewhere for a while sounds nice,” Cynn said. For his part, Miles recognized what the 10-day run in poker’s most prestigious event showed him about himself as a person and a poker player. When the final three players returned to action Saturday night, Miles held the chip lead, Cynn had the second biggest stack and former chip leader Michael Dyer was working with the shortest stack of the three. Michael Dyer came into the final day with just 16 big blinds and built his strategy around finding a spot to double or steal the blinds and ante. He was all in without a call on five of the first 180 hands of play, but it was the sixth all in on the 19th hand that ended Dyer’s night. Miles raised to 4,400,000 from the button with and Dyer responded by moving all in for 22,200,000. Cynn folded and Miles called. The flop didn’t offer Dyer much help, but the turn actually increased his available outs. The river didn’t fill Dyer’s Broadway draw and he was eliminated in third place. “I wanted a little more, but it was pretty good. I can’t complain. Third place, that’s more than you can dream from when you start the tournament,” Dyer said. That had allowed Miles to reclaim the chip lead he had lost just two hands prior and was now sitting on a stack of 203,500,000 to Cynn’s 190,300,000. In the modern era of the WSOP Main Event, the longest final table belonged to 2012 when Greg Merson needed 399 hands to win. Dyer was eliminated on hand #243 and over the next 10 hours and 23 minutes, Cynn and Miles played 199 hands on their own, put the total for the final table at 442. The lead changed over a dozen times during the course of heads-up action. With blinds of 2,000,000/4,000,000 (500,000), Cynn raised to 9,000,000 with and Miles responded 34,000,000 with . The flop came and Cynn called Miles’ bet of 32,000,000. The turn was the and Miles moved all in for 114,000,000. Cynn thought the hand through and called, giving Miles the bad news that he was drawing dead. The river completed the board, eliminated Miles in second place and crowned Cynn as the new Main Event champion.